Ziziki’s consistently serves a tasty souvlaki so I went searching for a recipe that I could recreate at home. I found a Lamb Souvlaki with Tzatziki recipe by Emeril Lagasse. This dish is quite good with lamb, however at $19.99/lb for lamb tenderloins, I serve it more frequently as Chicken Souvlaki. Mix ingredients #2-8 and pour over chicken (I like to marinate in a zippered bag). Marinate in the refrigerator for at least 2 hours or overnight. Preheat the grill. Flatten chicken while in zippered bag using the flat side of a meat tenderizer. This helps to create uniform cooking and the chicken will cook faster. Grill chicken (skin on) until it reaches at least 170 degrees – turning periodically to cook evenly. Remove from grill; remove skin; slice into strips. Pour 1-2 T of olive oil in a medium hot sauté pan. Place onion rings in and stir frequently to brown and soften. Halfway through, I get impatient and pour some water in the pan to speed along the process. Warm pita/nan in the oven or on the grill. To serve, place pita/nan on plate and then top with sliced grilled chicken. Place sautéed onion rings on top. Serve with a dollop of tzatziki. 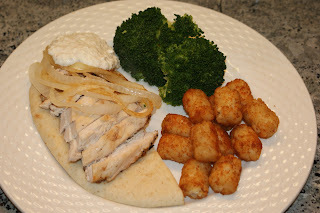 Ziziki’s serves it with oven roasted potatoes – my kids prefer Ore Ida tater tots. Add a vegetable, of course. Enjoy! Emeril’s tzatziki is quite tasty. At first my husband wouldn’t even try it until I read to him the ingredients and since it uses Greek yogurt (vs sour cream), he deemed it healthier and allowed it on his plate. You can "finely chop" the cucumber in a mini food processor. 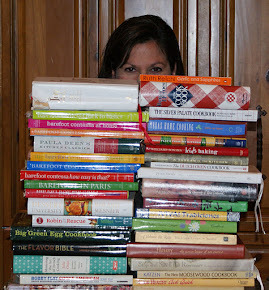 I have also heard that Barefoot Contessa’s recipeis delicious as well.